“I don't really ask too many questions and later on I can apply it to my own situation to see where it fits into my life, but normally when I write songs I write down whatever comes into my head, and I try not to make it too linear,. 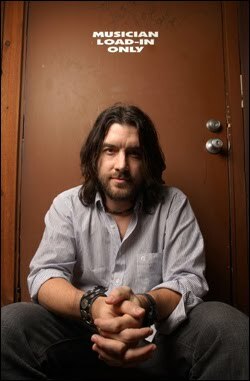 I'm not a big fan of writing about what's going on in my life,” said Texas-based rock 'n' roll singer Bob Schneider about the songwriting process. His latest album entitled “The Californian” is a collection of 14 songs recorded live - with the exception of a few vocal and guitar overdubs - in Austin at Jack Rocks studio, and are part of 27 songs recorded over a period of about four days. The work documents Schneider's band - aptly called The Bob Schneider Band - before the departure of its guitarist Billy Harvey who left once the group wrapped on the work. Schneider originally convinced Harvey to play with the band - Bruce Hughes on bass, Derek Morris on keys and Rafael Gayol on drums - for three weeks in 2001, which turned into four years. The latest recording process was a refreshing transformation for Schneider, who on his past solo albums, has focused on the production value, which forced him to slave away in the studio. Schneider, who is based in Austin, wrote all of the songs on the album, which became musical odes to the old-school recording process as the players took advantage of the use of vintage recording gear at Jack Rocks. Even the album's cover art is reminiscent of a classic rock record jacket. Born in the small town of Ypsilanti, Mich., and raised in Munich, Germany, Schneider, who also plays the drums, backed his musician father as such for a series of moonlighting gigs as a child in the European country. He later moved to Texas for school, majoring in visual arts. Prior to taking the solo artist path, Schneider meandered in the music world as a member of various bands. He initially dropped out of the University of Texas at El Paso to take on full-time musicianhood with the funk and rap band, Joe Rockhead that Schneider likens to the Red Hot Chili Peppers. Joe Rockhead released three independent albums from 1991 to 1993. With the breakup of Joe Rockhead, Schneider joined the Ugly Americans that signed a record deal with Capricorn Records in 1995. Schneider founded the musically raunchy group The Scabs in 1996, which released four albums between 1998 and 2001. He turned solo around 1998, and with his band, Lonelyland, scored a deal with Universal Records in 2001. The self-titled album shattered retail records at Austin's historic Waterloo Records shop, beating out the sales of teen pop stars and boy bands popular at the time. “The Californian” is today's quintessential rock album with its beguiling melodies, compact grooves and lyrics about a varied bunch of raucous people looking for a good time, whom Schneider describes as characters, adding that he finds it “fun” living vicariously through them within his own imagination and on stage.